The BBC reported last week that the International Mountaineering and Climbing Federation (UIAA) is considering a request from Nepal to reclassify five peaks within the country as 8000m peaks. The Himalayan Times has revealed a sixth peak in Pakistan is also being considered as part of a project which has been given the code name ARUGA (which if you Google it you will see, somewhat surprisingly, stands for Ailments Requiring Urgently God’s Aid). 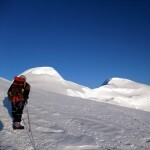 If the request is successful it will raise the number of 8000m peaks in the world from 14 to 20. It will also reduce the number people who have successfully climbed all of them from 31 to zero. It might even bring 69 year old Reinhold Messner, the first man to do so, out of retirement (but probably not). An obvious question springs to mind: why? Asian Trekking is owned by Ang Tshering Sherpa, a former president of the Nepal Mountaineering Association (NMA), and an advisor to Nepal Ministry of Tourism, who ultimately issue permits for mountaineering expeditions. Piecing the statements together it seems leading figures in the tourist industry in Nepal are pushing to have these peaks recognised as 8000m peaks because they believe it means more people will want to climb them, and this will significantly boost Nepal’s tourist income. Before I examine this theory, let’s look at the peaks in question and see if we think they should be classified as new 8000ers. Whether they can be considered separate peaks depends on a measure known as topographic prominence, the amount of re-ascent from the col separating them from their parent peak. Of the existing 8000m peaks, the least topographically prominent is Lhotse, standing just 610m above the South Col which separates it from Everest. If any of the proposed new peaks have a topographic prominence of 610m then it seems reasonable for them to be considered separate mountains. Thankfully, there is a marvellous website called Peakbagger.com, which not only lists the height of peaks and their subsidiaries, but their topographic prominence as well. I’m using this website as my source for the data below. I think it’s fair to say if any of these summits are separate 8000m peaks then Ronnie Corbett is a giraffe. 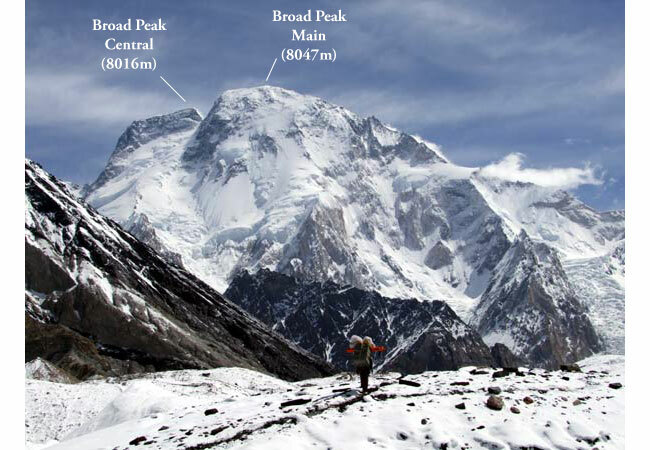 The most prominent one, Broad Peak Central is just 196m high and the least prominent, Lhotse Middle, is a meagre 60m. To put this in context, the highest mountain in Malta is 253m, while the Eiffel Tower stands a whopping 300m. I hope the UIAA will realise this when they come to consider it and laugh at the suggestion. Otherwise you might as well go the whole hog and throw in the South Summit of Everest as well. 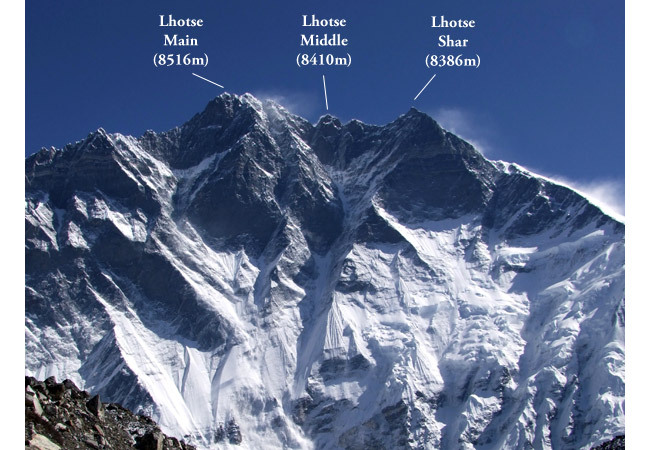 At 8749m the Nepalese would be able to claim the 2nd highest mountain in the world, and although its prominence is only 11m (the distance climbers need to drop before re-ascending to the Hillary Step), what does it matter if it means more people will want to climb it? Which brings me to the other question. Will more 8000m peaks mean more tourist income for Nepal? The number of people wanting to climb these peaks will be neglible. It’s undoubtedly true their status as 8000m peaks attract peak baggers to the existing 8000ers and bring them more climbers than the mountains which fall just below the magic number, like Gyachung Kang, Annapurna II and Gasherbrum III, but does it follow there will be a flurry of climbers to the new 8000ers? Personally, I doubt it. Most people who go to the effort of climbing Kangchenjunga, Lhotse and Broad Peak will want to climb the main peak first, and if they manage that they are more likely to head to a different mountain than return to climb one of the smaller summits. It’s possible people who have bagged the 14 main 8000ers will want to polish off the new ones, but as only 31 people have managed that so far it’s hardly going to make a monster pile of cash for the people of Nepal. Difficult subsidiary summits are more likely to appeal to route baggers rather than peak baggers. This type of gifted technical climber is attracted by a new route and its difficulty, and doesn’t care if it’s classified as a peak or not. Often a route like this gets its name and its prestige only after it has been climbed and described. This initiative smacks of style over substance, like the recent announcement to rename two more of these insignificant hummocks Tenzing Peak and Hillary Peak in the hope that too will bring more ascents. The idea of bringing in more climbers but reducing their impact on the environment by persuading them to climb lesser known peaks is an admirable one, but there are more concrete ways of going about it. Here’s a better idea. Instead of trying to get a smaller number of elite climbers to head for these insignificant avalanche-prone crags on a ridge, why not concentrate on getting large numbers of trekkers to climb much easier peaks. 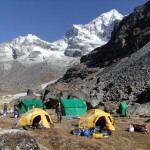 Nepal currently has just 33 designated trekking peaks. These are smaller peaks of only around 6000m in height. While some, like Mera Peak, involve little more than glacier walking for the most part, and are only a short step up in difficulty for many of the 1000s of trekkers who enjoy Nepal’s mountains every year, others like Cholatse are difficult technical climbs. What they have in common is they require little more than an ordinary trekking permit to climb them (hence the name trekking peak, which has nothing to do with the nature of the ascent). 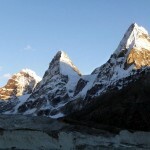 The size of these peaks mean that for many of them ascents can be easily incorporated into a three week trekking holiday. An example of a mountain which does need reclassifying is Dhampus Peak, a straightforward 6012m summit easily accessible from the Dhaulagiri Circuit trek. Currently this is classed as an expedition peak, which means more paperwork and a much bigger permit fee if you want to climb it, putting off many trekkers and part time mountaineers. Rather than spending time and energy headline grabbing by reclassifying dangerous minor ridge tops that are only going to appeal to a handful of people, the Nepalese tourist industry would benefit themselves far more in the long run by identifying and developing the infrastructure and attraction of these more accessible easier mountains. Well said, on both the prominence issue and the better approach. Case closed, I think. Thanks, Andy, glad you agree. I wish it were, but it sounds like this one’s going to run for a bit longer yet. Excellent article Mark, and very good point about trekking peaks and making them more accessible through better infrastructure. A good example of this is are Pisang Peak (6091m) and the Thorong La peak (6144m), which are supposedly very straightforward ascents and would make an excellent diversion from the Annapurna circuit. It’s very hard to find organised trips to these peaks (like there are to Island and Mera Peaks), even once you arrive in Nepal, yet I’m sure there are plenty of trekkers who would like to climb them and it would be well within their capabilities. Excellent article as usual Mark. When in Kathmandu for Manaslu, I had the opportunity to discuss this with Ms. Hawley. In her usual no-nonsense style, she simply said these peaks are already being climbed, albeit not often, so “recognizing” them will make no difference what so ever and not attract any new climbers. She went on to say, why would anyone climb the lower peak and not go for the higher one? Or put another way, the higher one is the prize (my words). Thanks, Alan. That confirms my hunch. She has all the stats, so if anyone knows whether these peaks are more likely to be climbed then it’s Elizabeth Hawley! Matt, you’re right to highlight that area of Nepal. Now the Annapurna Circuit has lost some its attraction as a trek with the arrival of the road, the flip side is the area around Manang has the potential to become a fantastic mountain centre. As well as the two trekking peaks you mention (one of which hasn’t been classified as such) there are the 4 Chulu peaks, and a number of possible 7000ers not far away, like Annapurna IV, Kangguru and Himlung. For trekkers you’ve got the ice lake above Braga, Milarepa’s Cave and Tilicho in easy reach, and although I’m not much of a rock climber I believe the massive 1500m slab of Paungda Danda on the Circuit near Pisang has potential in that direction. Mark, your comment about the road is very farsighted – I’d never thought about it like that. I was very disappointed when I did the Annapurna Circuit 2 years ago (after 1st doing it 15 years ago) as it does feel like the ‘show’s over’ once you reach Mutkinath (assuming you started at Besisahar). I’d been think that once the road was completed it would pretty much kill off the Manang side too in terms of interest from a trekkers viewpoint – but for mountaineers it could really open the possibilities up. We initially wanted to do Pisang Peak as an add-on, but it was going to cost us $2,500 extra (for the two of us) on top of the cost of doing the trek. It didn’t seem value for money for what effectively was a 2-3 day detour. Once the road is finished (and I think it may be another 5 years yet), it will greatly reduce the transport costs of goods and Manang has the potential to become Nepal’s first Alpine resort, but with Himalayan mountains. This could really open up the region for mountaineering and make up in some part for the demise of the trekking route. …Wasn’t that the company that David Sharp was with? I believe he was climbing solo and unsupported the year he lost his life on Everest.